Dan Hotchkin, Head Golf Professional at Palatine Hills Golf Course, showed off a 7 iron from his first set of clubs purchased 50 years ago, as he addressed a crowd of over 70 golf enthusiasts gathered at the Palatine Hills Golf Course June 22. “After 50 years I am still using a similar club to hit a round ball into the hole in as few strokes as possible, “ Hotchkin laughed. According to Hotchkin, Palatine Hills has seen an estimated 1.5 million rounds of golf in its first 50 years. The 50th Anniversary Celebration focused on the past, present, and future of Palatine Hills Golf Course. Course Superintendent Brad Helms reviewed the course’s history, including how Palatine Park District acquired the land in 1965 from nine different owners. Palatine Park District Executive Director Mike Clark reviewed the current state of the course, which includes the Hills’ Short Game Area, officially opened with a ribbon cutting at the event. 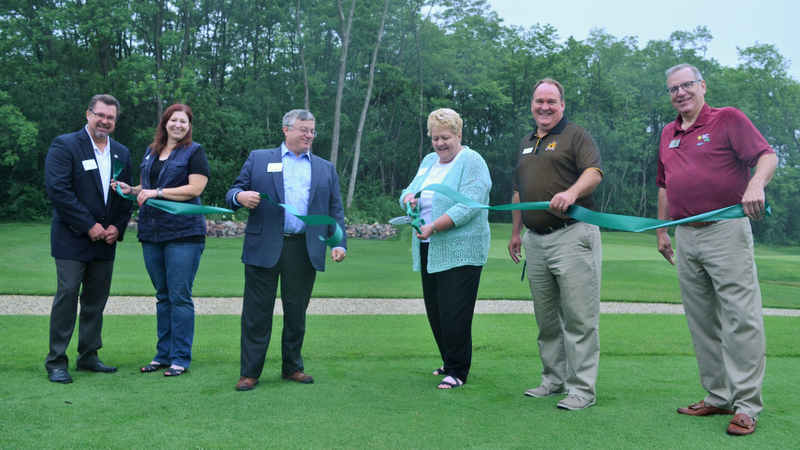 Although the rain began to drizzle, it didn’t deter the enthusiasm as Park Board President, Sue Gould, cut the ribbon held by Board Members, Jennifer Rogers and Jay Cozza, Mike Clark, and Doug Myslinski, designer of two of the short game area greens. Four golfers, representing the past, present and future of Palatine Hills Golf Course, hit balls onto the green. Larry Niemczyk, long time golfer at Palatine Hills and two- time Palatine Hills Golf Association (PHGA) President, represented the past, present representative was Mark Johnson, three-time men’s club champion and Palatine High School Boys’ Golf Coach, and new members of the PHGA’s Junior League team, Jack and Merritt Bell, represented the future. 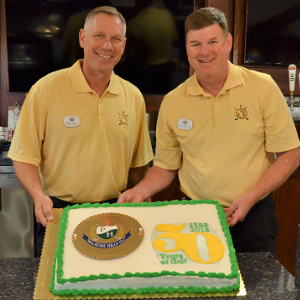 Golf Course Superintendent Brad Helms (left) and Golf Operations Manager & Head Professional Dan Hotchkin with a Palatine Hills 50th anniversary cake. A time capsule representing the course’s 50th year was begun at the event and items will continue to be added throughout the year. Event attendees, Tim Geier and Bill Knudsen, members of the PHGA, said the course and association provide a “country club” feeling without the high costs. “The Association is open to all,” Knudsen, past President of the PHGA Board said. There are currently over 160 members and highlights include permanent weekend tee times, holiday events, a Ryder Cup event, monthly travel events, and regular Thursday morning games. “The staff are very friendly and helpful at Palatine Hills and the course is very challenging,” Knudsen added. The 50th Anniversary Celebration will continue with “Throwback Weekends” July 2 through July 8 and August 10, 11, 12. Highlights include green fee specials, giveaways, raffles, and contests. Visit palantinehills.org for more details.